Many people say: “choose a job that you really like and you won’t have to work a single day”, and this is true, each of our collaborators in Delphinus live each day like it were a unique experience. They help our visitors understand the importance of belonging to the environment we live in and must take care of. For 25 years, Delphinus has accomplished that all visitors build a tie with nature through the interaction and swim with dolphins in Mexico, shaping their activities to not only create or generate better experiences, but also promote marine environmental care and the inclusion of the local community through the implementation of different programs. How can we be so sure of that? We are sure about Delphinus high quality of work because in 2015, the Great Place to Work Institute of Mexico,certified us as one of the best companies to work for in the country. This is due to the respect, credibility, impartiality, sense of pride and companionship that characterize our work environment. Fair and correct treatment regardless of age, race, gender or sexual preference. Sense of pride that emerges when goals are achieved, which also has a special significance on a personal level. The facilities (business center and habitats), which were cataloged as physically, psychologically and emotionally healthy places to work in. 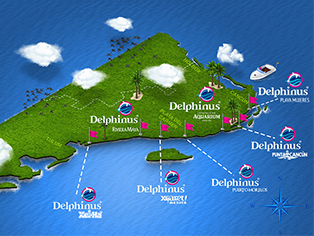 In Delphinus, we are happy to be part of a team that is concerned about marine life and want to share this feeling of responsibility to all our visitors that come to interact and swim with dolphins in Mexico. Hear it from our team itself and discover how incredible it is to be part of this family. Come to Delphinus and witness for yourself how a swim with dolphins is a unique moment of trust and awareness of the environment we live in.